December is not only a time for New Year’s forecasts, but also holiday shopping. I have two young nieces and a nephew who I buy gifts for, which I then ship north to my family. While shopping, it seemed that nearly every item boasted some great technological feature. Interactive, learning robots. Bluetooth speakers that have Amazon’s Alexa built in. Of course, Alexa is always listening and ready for your questions. And once I ship those gifts, I can track them almost every inch of their journey north to my family in Kentucky. Almost everything is connected now. We can talk to it, track it and teach it to expect our needs. The Internet of Things (IoT) will continue to be a driving force in 2018. It will succeed in making companies run more efficiently. They will be safer. Production will rise and costs will fall over the long term. While we’ve been talking about the IoT for several years now, there’s still ample room for growth. The Boston Consulting Group estimates that the IoT market will swell to $267 billion by 2020. 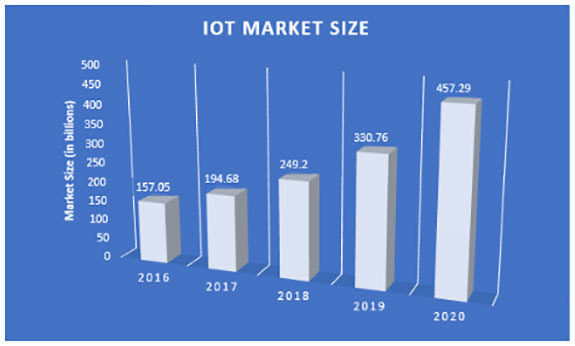 GrowthEnabler and MarketsandMarkets’ analysis expect the IoT market to jump to more than $457 billion in 2020. That’s up from $157 billion in 2016. Gartner forecasts that more than 65% of enterprises will adopt new IoT products by 2020. This is an increase from 30% today. What’s more, 72% of companies will increase their IoT spending in the next three years, according to a Cognizant trend study. Statista breaks down the IoT growth across the various market segments. 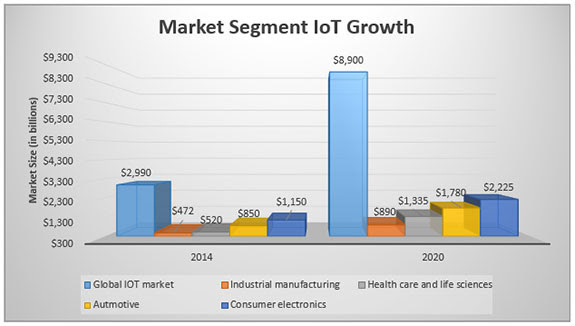 The group expects the IoT market in industrial manufacturing to grow by nearly 89% from 2014 to 2020. The IoT in the health care and life sciences sector will grow an estimated 156% from 2014 to 2020. And the automotive sector expects to see its IoT market double in size from 2014 to 2020. Of course, these are just forecasts for expected growth. The key thing to remember is that they all point to one thing: stellar growth. Competition for consumer dollars is fierce. If a company wants to claim the top spot, it’s critical that it is running as efficiently as possible. Consumers want to track their purchases. They want their goods to be responsive. They want fresh and new. And they are always looking for a bargain. IoT sensors, software and data analysis represent the tools that will get companies to that next level. And if you’re looking for the sector that will dominate in 2018, the IoT will be front and center. Companies will invest heavily in software and sensors. They will look to Big Data for the collection and analysis of massive amounts of data. From that data, companies get valuable information. That information can predict everything from shopping habits to health risks. Paul Mampilly has been tracking the IoT revolution in his Profits Unlimited newsletter. He will be keeping readers updated on great new opportunities within the IoT sector in 2018. It’s a good idea to make a little room in your portfolio in 2018 for some IoT companies. They are going to soar.